Back of the Yards, in the New City community area, extends from 39th to 55th Streets between Halsted and the railroad tracks along Leavitt Street, just south and west of the former Union Stock Yard. For years the neighborhood was sustained by the thousands of meatpacking and railroad jobs that the livestock industry supported. But since most of the meat packing plants had closed by the late 1960s, the community has struggled with employment, housing and all the other issues resultiing from the loss of jobs. 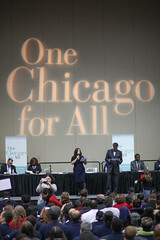 During that time, the Back of the Yards Neighborhood Council, a coalition of dozens of neighborhood and parish groups, became Saul Alinsky's model for community organizing throughout the country as it galvanized a broader community identity among the diverse ethnic groups and addressed an array of community problems. BYNC is the lead agency in Back of the Yards. Download the 2014 Back of the Yards quality-of-life plan. In recent years, the site of the old stockyards has been transformed into a new industrial park, bringing back some of the jobs that had disappeared earlier. Community groups from around the city are getting funding and training to improve their youth baseball facilities, thanks to the Cubs and LISC. Around the city, LISC is helping communities establish and run Special Service Areas to cover the costs of security, beautification and special events for local small businesses. There’ll be lots of painting, raking and mowing on Saturday, June 1, when several of LISC Chicago’s local partners turn out for the annual NeighborWorks Day.